The delightful Catherine Kirby - author of Sari Caste and See Through - invited me to lunch at her house this Saturday. I was greeted by a champagne cork popping and we enjoyed a delicious feast before caving in and gravitating to the computer to discuss books, Twitter, promotion versus writing and our current Works In Progress. So nice to meet this lovely lady, and her family, face to face and thank her for all the help she has given me since we met via www.youwriteon.co.uk about 18 months ago. 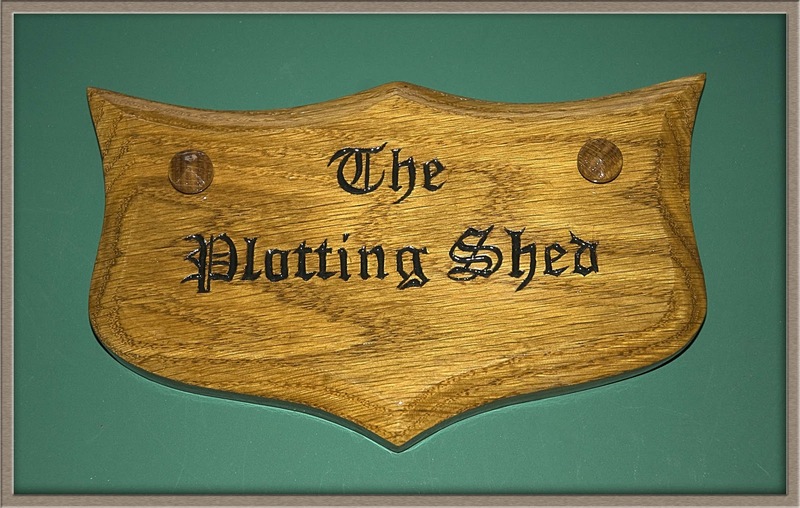 To add to the joy her clever husband has made a plaque for my writing shed. They came up with the name between them. If it ever stops raining I shall attach it to my wooden shed at the end of the garden with great pride. Here's a pic.